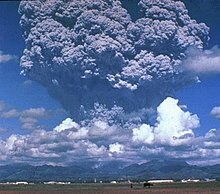 This article is about the volcano on Mars. For other uses, see Olympus (disambiguation). Lava flow during a rift eruption at Krafla, Iceland in 1984. 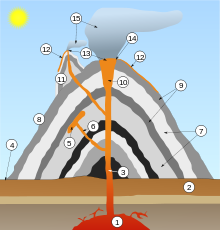 A diagram of a strombolian eruption. Crater of Mount Tangkuban Perahu, West Java, Indonesia. Black Rock Volcano an extinct cinder cone near Fillmore, Utah. Vulcano island with the north coast of Sicily in the background.